She was a natural performer. Usually it was a complex dance routine with costumes and ballet slippers ... in the middle of a party. Years later she "trained" her sister to perform with her ... well ... I should say she tried to train her. Alissa was content to do her "bobbing head" routine. No other part of her body moved. Will Ferrell and Chris Katan stole the routine (a few years after Alissa patented the move) when they did "What Is Love?" 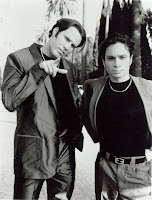 in Night at the Roxbury. Alissa could have probably sued them both. Meals at restaurants were always interesting. Once we had a waitress that Nikki stared at the whole time she took our order. After a few minutes Nikki tapped me on the shoulder and asked me in a whisper that could be heard at the next table .... "Dad ... why does that waitress have a moustache?" She was also "slightly" competitive. Playing any game like Go Fish usually required other participants to wear helmets and pads. Whenever she lost at a game ... her mother and I would leave town for a week. I remember even at Easter when the kids hunted for eggs ... Nikki did a full survey of the property to make sure she would maximize the number of eggs she could get. She was 21 at the time, I think. But the day I will always remember was the day she decided to cut her eyelashes off. That's right ... chopped them right off. I remember her mother and I spent weeks researching whether eyelashes actually grew back. They do by the way .... but the hair on a father's head never does. You were the most handsome children's shoe salesman Gus Mayer ever had and this is the most precious blog I have ever read(it's also the only blog I have ever read) I'm hooked.